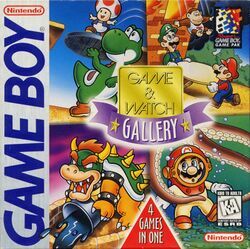 Not to be confused with Game Boy Gallery. Game & Watch Gallery is a collection of games originally released on Nintendo's Game & Watch. The game includes both original and Modern versions. The original features nameless individuals as the main characters, while the Modern version features Mario and his friends along with updated graphics, updated gameplay, and music. Three sequels followed Game & Watch Gallery: Game & Watch Gallery 2, Game & Watch Gallery 3, and Game & Watch Gallery 4. Game & Watch Gallery features a system for earning stars. Every 200 points the player scores in a minigame is worth a star. The player can earn up to five stars in each mode of a game. As the player collects stars, they will unlock features in the Gallery Corner. If the player earns five stars in a Modern game, they will unlock a very hard mode called Star Mode. The player can earn a total of 80 stars. Manhole – Pedestrians are walking back and forth over a hole-filled floor, forcing the player to block the holes with a manhole cover in order to prevent the others from falling through. Fire – An apartment is on fire, forcing the people inside to jump out of the window. The player controls two firemen that use their trampoline to bounce them across the screen to safety into the ambulance. Octopus – While a sea diver is diving for treasure, he must avoid the Octopus's arms. Oil Panic – The Station Helper must collect oil dripping from the ceiling in a bucket and dump it to the Station Manager before the bucket overflows. Manhole – Toad, Donkey Kong Jr., and Mario are the pedestrians in this version, walking at different speeds, while Yoshi is the character the player controls. In this version, four manhole covers can stay up at once, unlike the original. The manhole covers can drop from characters stepping on them, causing the next pedestrian to fall if Yoshi does not act quickly. Yoshi can also hold a manhole cover in place to keep it from falling. Fire – The setting is now Princess Peach's Castle. The pedestrians are Toad, Yoshi, and Donkey Kong Jr., who all fall according to their weight, while Mario and Luigi are the firemen in this version. New to this version is an egg that contains either a Super Star, which contributes bonus points, or a Bob-omb, which counts as a miss when carried to safety. Octopus – Mario is the diver here and must deliver treasure to Princess Peach. His speed is affected by how much treasure he is carrying, but he can throw his bag of treasures at the Octopus's arms. Bonus points are awarded depending on how much treasure he gives to Peach. Oil Panic – This time, the oil is dropped by Bowser, and Mario has two buckets to catch oil with. Yoshi serves to dispense oil and can even be used to take out Bowser from the top of the castle, gaining bonus points in the process. There are sixteen games in all displayed in the Gallery Corner. The first four are unlocked by getting 400 points in the Modern version of a game. The four after that are achieved through 400 points in a Classic game. The next four are shown by getting 800 points in the Modern games, and the final four games are won through 800 points in the Classic versions. These games are for display only and not playable. Luigi, Peach, and Bowser watch Mario playing the Game Boy. Peach shows off a Game Boy. Playing on the Super Game Boy displays a Super Nintendo Entertainment System controller instead of the bottom of a Game Boy Pocket when selecting the mode for each game. Some sprites of the alarm characters from Manhole, Fire, and Octopus were going to appear in this game, but they were scrapped for unknown reasons. This page was last edited on April 13, 2019, at 23:09.